A big trend in Couture wedding invitations is BLACK & WHITE! I love this classic theme made modern. At Lela New York we add a little something extra to this classic. Here is an example of one of our latest in Black & White invitations. Lela New York used silk invitation holders along with our silk invitation pouches to hold everything together. We added a little extra sparkle with a crystal and beaded embellishment. 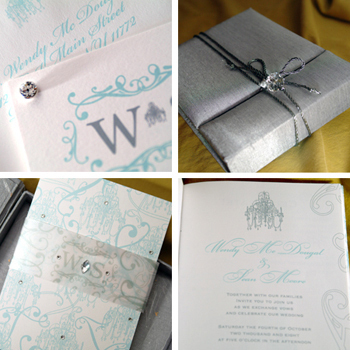 The couture wedding invitation was then boxed and sent out to their guests. 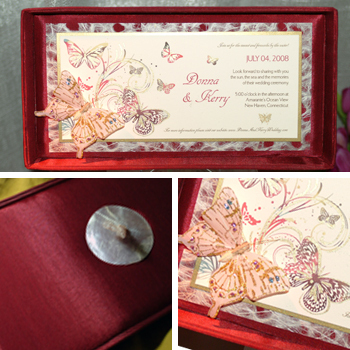 These Couture wedding invitations were designed with Ivory silk outside and Gold silk inside. Lela New York's Gatefold Silk Box Invitations are custom designed for our clients. 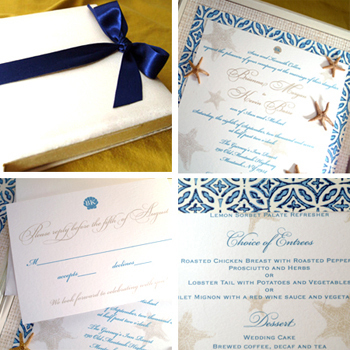 This particular custom wedding invitation includes a lace detail that reflects the brides couture lace gown. Simply Luxurious! Designed for a New York wedding. Super Eye candy! My favorite wedding dresses. They are just gorgeous! I love this Vera Wang, it's structured on top and free flowing at the bottom, so romantic! Tara Keely's dress is beautifully smooth on top with a black belt detail, so classic. Lazaro mixed my favorite details, a smooth satin with lace. Kenneth Pool's Coverup is amazing! Ines Di Santo's cover up is a small little cape that is so beautifully delicate. I love this Carolina Herrera with all the pleated details. Amsale is always clean and classic! 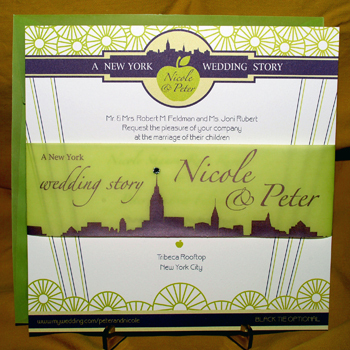 A great way we at Lela New York personalize invitations is by adding a custom designed logo. It's a modern way of having a monogram. It may include the names of our clients, their first initials and elements that are included in their wedding or part of their wedding theme. It can include your flowers and colors as well. Here are some examples of Lela New York logos. We love our wedding gowns to be clean and perfect for our big day. But every once in a while there is the accidental stain put on out pristine dress or the unfortunate bead that starts to fall off. What shall a girl do when there's an emergency to take care of? Well I just found out about Hallak Cleaners emergency kit. And who better than a couture cleaner to take care of any little stain emergency. The kit contains 2 pre-spot formulas as well as other cool stuff like a sewing kit, adhesive straps , pins and more. For more info visit http://hallak.com/wedding-gowns.html. Picture from Us Weekly July 21, 2008. I love Ivana's dress, shown here in US Weekly's July 21st issue. It's a Reem Acra gown and she paired it with Christian Louboutin Heels! I also love her hair tied back with a flower on the side, so chic and elegant. For more of her wedding check the latest issue. I am not a big fan of the gym, so when I heard of the Fit Flop, I was amazed that I can just do my normal everyday routine and still get in shape! Its engineered for lifting and firming in all the right places while you walk, and its great for summer and getting fit for your special day! They come in a variety of colors and have a nice sporty look.